CURRENT Athens is an online platform for the promotion of contemporary art. 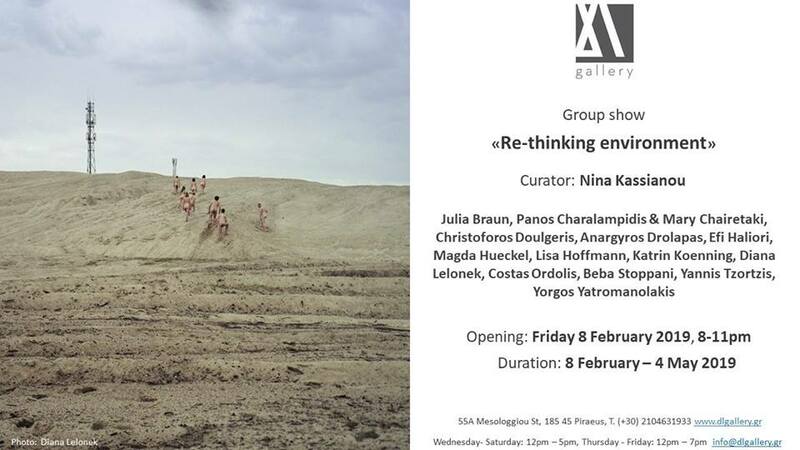 DL Gallery presents the group exhibition of photography titled «Re-thinking Environment», curated by Nina Kassianou on Friday 8 February 2019. Life takes place in many different environments: in natural or urban landscapes, in recreational sites, industrial premises, and in travel explorations. How does the character and appearance of our environment, influence our experience of space we live and move? And how that space and that experience are interpreted and presented by photographers? These are the questions which form the starting point for the exhibition, Re-thinking Environment, a trip through the human nature. This exhibition is about the experience of the environment, in all its manifestations, which reveals the emotions and thoughts that the photographers has projected on it. The diverse and multi-faceted ways which photographers perceive this experience echoes the breadth of this exhibition. By examining issues related to nature and humanity Re-thinking Environment contributes also to the ongoing debate around the world on environmental awareness. The scope of the photographers, involved in this show, explores the changing nature and points out the need for a dynamic interference to prevent environmental deterioration. The exhibition is a journey followed by 14 artists which spans a wide range of photographic genres including all the kinds of contemporary photography. Like nature itself, this is an exhibition not just to be seen, but to be experienced.